In this Probius Build Guide, we provide an overview of his strengths, abilities, talents and matchups. Probius is a unique Specialist hero and is in a somewhat similar vein to Gazlowe in the sense that his strengths lie in area denial and controlling a specific location. 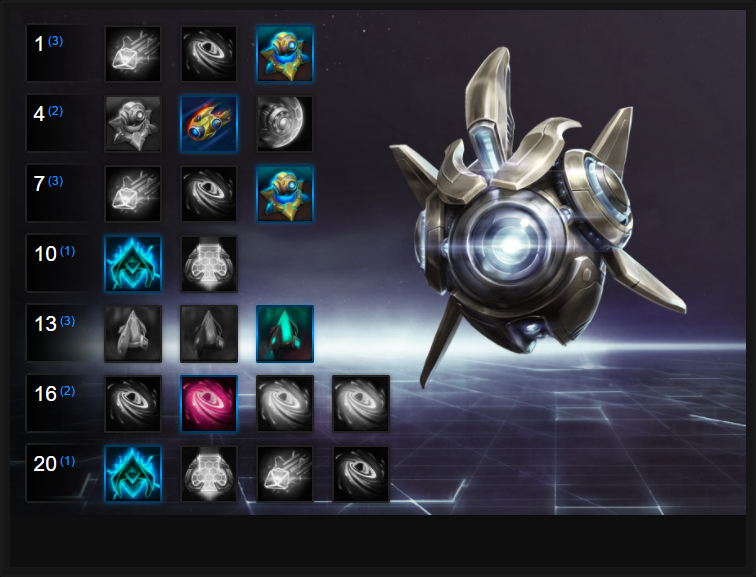 Unlike Gazlowe however, Probius is undenidably stronger and in part that's not only due to his trait (Warp in Pylon) providing huge amounts of mana return, but also because his other abilities (Disruption Pulse, Warp Rift and Photon Cannon) are not only quick to assemble, but also deal significant damage. What's particularly interesting about Probius isn't just his strength of area denial, but the fact that even without his Pylon's or Photon Cannon's he's still more than capable of dealing solid damage when stacking his Warp Rift before detonating it with Disruption Pulse. I will stress however that Probius is undoubtedly strongest in a group setting, where a front line can protect him and his summons. However, he's surprisingly formidable 1 on 1 especially if a couple of Pylons active, and a Photon Cannon available. Despite this flexibility, Probius can die incredibly quickly and his only escape is linked to his "Z" which has a lengthy cooldown by default. If you also factor in his lack of crowd control, he needs strong positioning to be able to survive. Warp In Pylon - Fundamental to Probius' play is his trait, Warp in Pylon. While he can function without them, Probius doesn't regenerate mana by default and he's also incredibly vulnerable to "ganks" due to his lack of crowd control. With that in mind, his Pylon's - which you place every 14 seconds - not only return a huge amount of mana when within their area (about 100/s) but they also provide some much needed vision. Not only is placing these Pylons key to Probius' play style, but it's also imperative that they're placed in positions where you can utilise their mana return, while still seeing enemy players. Ideally, they want to be either side of a lane, in a bush or vent, and you need to ensure they won't die easily as although they have a reasonable health pool, they can die quickly if focused. If they do, that's a long time without access to vision or mana. Worker Rush (Z) - Probius has no mount and relies on his base movement speed being 10% quicker than other heroes to get around the Battleground. Not only this, but he also has Worker Rush which allows him - temporarily - to zip around at 60% increased movement speed for 5 seconds. Ideally, you want to be using this ability when returning back to lane, or when you need to quickly reach an Objective before it spawns. Disruption Pulse (Q) - As your primary form of poke, Disruption Pulse has two functions. The first is that it passes through all enemies, allowing you to fire it straight forwards to soften up a minion wave. The second is that it acts as your incendiary for your Warp Rift and on contact, will detonate it for additional damage. With a low cooldown and relatively cheap mana cost, you can afford to use Disruption Pulse a few times without any active Pylons. Ideally however you want to ensure you always have it ready for when you want to detonate your Warp Rift's. Warp Rift (W) - Your primary form of area denial and wave clear - as well as your only means of spike damage - Warp Rift comes with two charges. When you cast it, Warp Rift will open after 1.25 seconds and slow nearby enemies. Although the amount is small (20%) its the fact you can cast two at once, to cover a large area, and that they last for 9 seconds. "Detonating a Warp Rift with Disruption Pulse." It's a huge amount of time your opponents can't do anything about until you choose to detonate the rift with Disruption Pulse. Ideally, you want to not only cover a close-quarter location with two so that if the enemy do choose to fight you, they're risking huge damage to themselves. Photon Cannon (E) - I would argue this is Probius' weakest ability and that's purely on the fact it can only be created near a Pylon and by default, you can only have one active at a time before it despawns. It will automatically target nearby heroes and fires one round every second (or there abouts). Its damage isn't incredible and instead it acts more like a damage over time ability. "Try to protect your Pylon's when Photon Cannon is active, otherwise it'll deactivate when the Pylon dies." What's interesting about Photon Cannon however is that if your Pylon is destroyed while it's active, it will stop - and reactivate - if you summon another Pylon. If you can, try to always place your Photon Cannon where it can hit enemy players but without being in the direct line of sight for AOE attacks. It can die quickly and most heroes can comfortably kill it 1 on 1. Don't be afraid to use it in lane however as your Pylon's will ensure it has no real mana cost. Pylon Overcharge (Heroic) - Without doubt his best Heroic, Pylon Overcharge allows Probius to increase the size and power of his Pylon's so that they blast enemies at rapid speed, from a frightening distance. Lasting for 10 seconds, they'll attack any enemy players within their radius and considering their range, provide incredible zoning potential. What's also fantastic about Pylon Overcharge is the fact it passively grants shielding to them (making them much harder to kill). If there's one downside to this Heroic it's the fact it's best on Objective heavy Battlegrounds where you can setup two Pylons early so be sure to use your Workers Rush to get there early. Null Gate (Heroic) - Functionally similarly to Tassadar's Force Wall, Null Gate is a much more aggressive version. Rather than preventing players from moving, Null Gate causes an 80% slow and deals around 150 damage every second they come into contact with it. "Be sure to cast Null Gate so that when placed, it cuts off as many players, for as long as possible." Enemies passing through can usually get out the other side after about 3 seconds (perhaps a little less) but if you place the Wall in difficult positions, you'll ensure your opponents struggle to reach the other side. I've found Null Gate to be particularly good on Battlegrounds such as Blackheart's Bay where you can't always guarentee you'll have Pylon's in place ready for a fight. If the enemy team has a stealth hero, taking Gather Minerals is an amazing talent (even if they don't, to be honest). It boosts the health of your Photon Cannon every time you collect minerals which drop off minions (up to 560) but it also allows you to boost its damage by 35% and have it reveal stealthed heroes when you've collected 70 minerals. Brilliant for boosting your damage. Variable: Warp Rift is the main source of damage and wave clear for Probius so taking a quest line (Warp Resonance) that increases its damage is a strong choice. After hitting 10 heroes you'll increase its damage by 100 and when you hit 30, gain an additional Warp Rift charge. It's fairly easy to complete, especially on Battlegrounds such as Infernal Shrines where players have to group together. With no means of mobility outside of Worker Rush, Turbo Charged is a no-brainer. Not only does it boost your passive movement speed by an additional 10% (bringing it to 20) while in a power field but also reduces its cooldown by half (from 40 to 20). Variable: Shield Capacitor is a good compliment to Gather Minerals as it grants Probius a 10% shield at all times and one which replenishes when he isn't suffering damage. Against the likes of Valeera or Zeratul, it's a good choice. Building on Gather Minerals, Tower Defence allows for much more up-time with your Photon Cannon. Every enemy hero it hits reduces the cooldown by 1.25 seconds. Considering a Photon Cannon lasts 13 seconds and it has a cooldown of 15, you can maintain 1 permanently. Variable: Rift Shock boosts the value of Warp Rift by effectively causing vulnerability on any heroes affected by the detonation. This allows Probius to deal 20% more damage for 10 seconds against the enemies affected. It works on all Probius' abilities - including basic attacks and is a nice little boost, especially after your burst. On Objective heavy Battlegrounds when you can arrive early, Pylon Overcharge is exceptional. Not only does it allow your Pylon's to deal high damage, but the range of their attacks ensures anyone near an Objective you're trying to contest is going to take huge damage if they remain in the area. If you're after pure sustain, Shield Battery is a good talent. Allies near Pylons gain 24 shielding per second, up to 96 (+4% per level) and the shield persists for 2 seconds. Ideally, if you can place a Pylon near allies and where they'll fight it's solid mitigation. Variable: Aggressive Matrix allows Probius' Pylon's to boost the attack damage of any ally in their radius by 35%. Although this does mean you need to place your Pylons more out in the open, for heroes such as Zul'jin or Valla the damage boost is enormous. There's a lot of choice at level 16 but I've found Gravity Well to provide the most bang for your buck. Key to Probius' play is area denial and this talent allows your Warp Rift's to cause a huge maximum slow (up to 60%) for anyone near its middle. Whether you're blocking a path with a rift or retreating, the slow is undeniably good for kiting and being a nuisance. Construct Additional Pylons is undeniably good as it allows Probius to summon 3 Pylons instead of 2 but also boosts their damage by 25% when you activate your Heroic ability. It's a significant boost that also allows you to cover more ground with your Pylon's to utilise your level 13 talent. These Hero Threat Levels (1 being lowest threat and 10 being highest threat) are to help you determine which enemy Heroes can give you a headache. For the Heroes listed here, take extra care as they're particularly dangerous for Probius. Thrall: His root, ranged poke and self healing are very difficult to deal with. As you have no ability to Cleanse yourself, you'll take a beating during his attack. The Butcher: You can't really escape him if he decides to use his Lamb to the Slaughter. You're pretty much free meat. Illidan: Evade, self healing, mobility, damage - he's a headache you just can't get rid of and your knockback won't save you. This list of tips and tricks are just a handful of things we think will help your Probius play. We'll continue to add to the list as required and if you have any tips you'd like to share, let us know in the comments below and we'll place them here. 1. Warp In Pylon is key to Probius' play as without it, he cannot regain mana or summon his Photon Cannon. Always place them in safe locations so you gain mana, without risk of them dying. 2. When inside a Pylon's radius you have infinite mana. Don't be afraid to spam your abilities to clear a lane or pressure an enemy player. 3. Well placed Pylon's ensure Probius can bully just about anyone in lane if you poke with Warp Rift and Disruption Pulse. Just be aware you have no means of healing yourself. 4. Try to always have your Worker Rush available for escaping and/or arriving to an Objective. It's key you get to Objectives early so you can setup your Pylon's. 5. Remember that Pylon's provide a significant amount of vision so it's a good idea to place them in bushes or vents to give you clear sight (it also helps keep them alive from enemy heroes who aren't aware they're there). 6. Worker Rush is your only means of escape as the speed boost is significant. Unfortunately it doesn't remove crowd control so don't use it too late. 7. Probius' basic attack deals terrible damage and puts you a very close quarters. Stay back and use your abilities instead. 8. Be sure to use Warp Rift for area denial as much as damage. Placing two across a lane (vertically or horizontally) and maximizing their up time of 9 seconds) will make any player wary of dealing with you. 9. Photon Cannon can only be summoned near a Pylon and deals relatively slow damage to a single target. By all means use it in lanes against minions, but it's best to position it against enemy players where it can still attack, but won't suffer AOE damage. It's fairly squishy by default. 10. Warp Rift is incredibly for clearing minion waves, especially if you detonate two with one Disruption Pulse. Be sure to deal with Merc's pushing down a lane before using Worker Rush to rejoin your team. 11. Remember that Disruption Pulse passes through players. If a warrior is attempting to body block a low health hero, you an sometimes snipe them down by firing through them. 12. Your Heroic, Pylon Overcharge, has enormous range. Don't be afraid to boot them early during a team fight as the Heroic lasts a considerable amount of time. 13. Try to always have one Pylon available to cast when you summon a Photon Cannon. If your Pylon is destroyed, you can then instantly place another to keep your Cannon firing. 14. Be very careful when the enemy team chooses a stealthed hero. Probius only has 2900 health at level 20 and can be blown up fairly easily. Take my recommended variable talents.